Hello sweet friends and welcome to my creative space. I have participated every year that Karen has been hosting Where Bloggers Create. It is a way for my to clean, organize and update my space. Not much has changed other than the supplies and vintage goodies that get bought, collected and then used. Years ago my husband and I finished out our basement and added my studio space. It is a place that I long to create in. 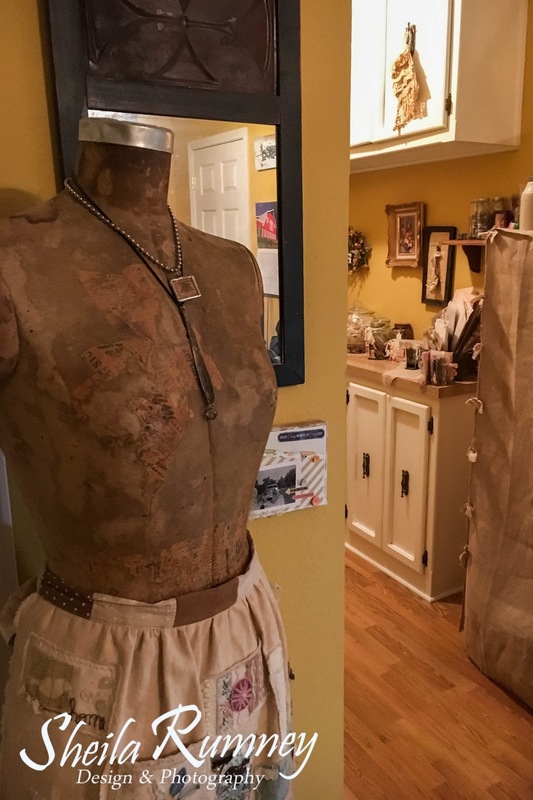 This is one of the many treasures I have in my space, Ms. Clara M. She proudly displays Silver Bella apron and jewelry. I love having this organizer right above my creative space. It always me easy access to some of my go to supplies. My space also includes beautiful family photos, ephemera and vintage treasures just waiting to be used. My great grandma's jewelry box holds more treasures. 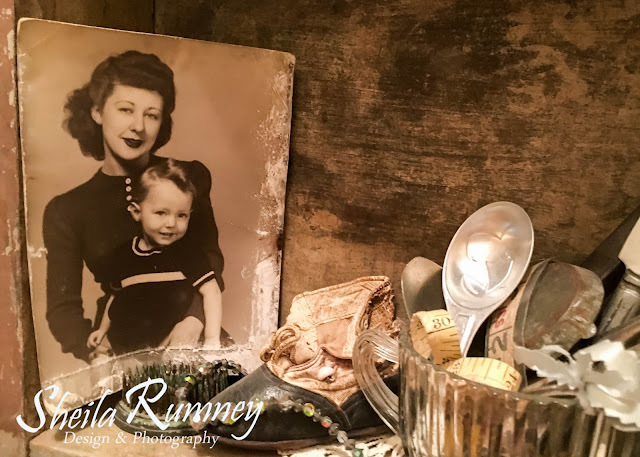 I love the mix of family treasures and vintage finds that complete my creative space. 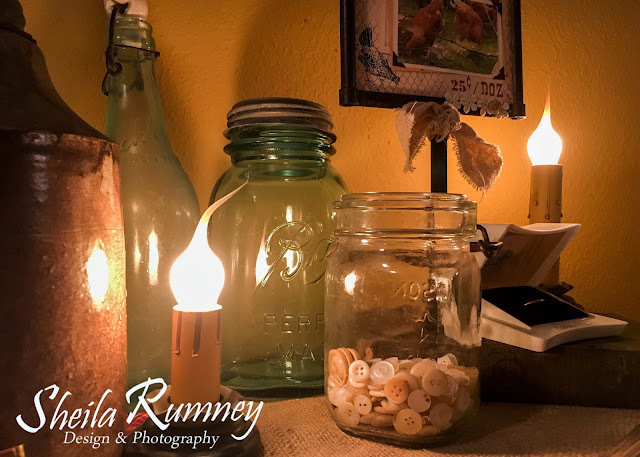 I hope you enjoyed a little peek into my studio. 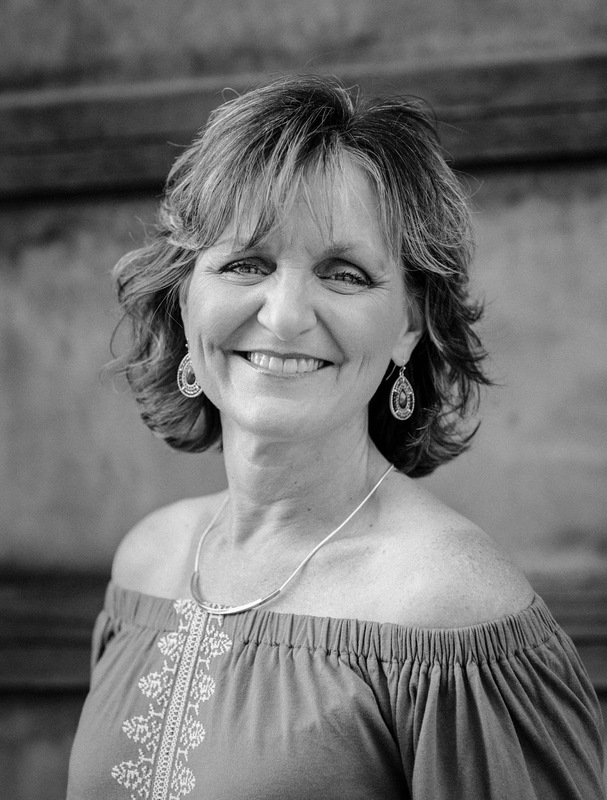 Thank you Karen, for hosting another wonderful Where Bloggers Create party and thank you for popping on by my studio. Can't wait to visit all the other party goers creative spaces! HELLO, hello.... (didn't mean to shout) I love your great grandmother's jewelry box, holding your treasures! Thank you for allowing us into your beautiful creating space! Love your space! And I'll be back soon! I am crazy abut your space. All that stuff is stuff I like. Such a great little spot for creativity! Lots and lots of good ole vintage eye candy here. Thanks for sharing with us. 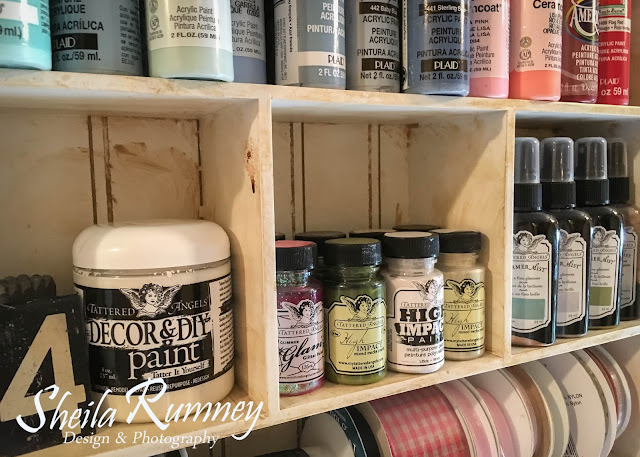 I loved this peek at your space! Nice space! Love all the pretty little goodies! Thanks for the peek! I absolutely adore your Ms. Clara M., dear one! My dress form is affectionately named, "Lizzie". Shortened form of Elizabeth. 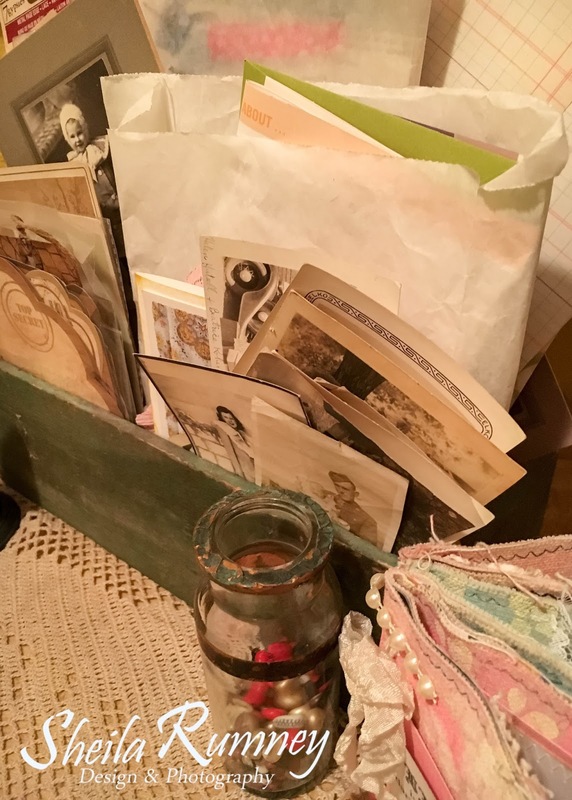 Your creative space is truly filled with inspiration through heirloom photos and gems from the jewelry box! What a lovely studio! I like the soft lighting, the treasured momentos, and especially your mannequin! 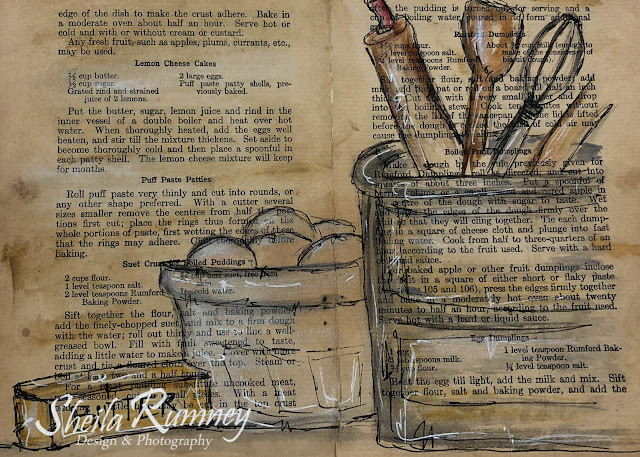 With so much loveliness surrounding you it is no wonder that you love to create in this space. I have enjoyed looking at your space. Thank you for continuing to participate in WBC, it is always a pleasure to see your lovely space. 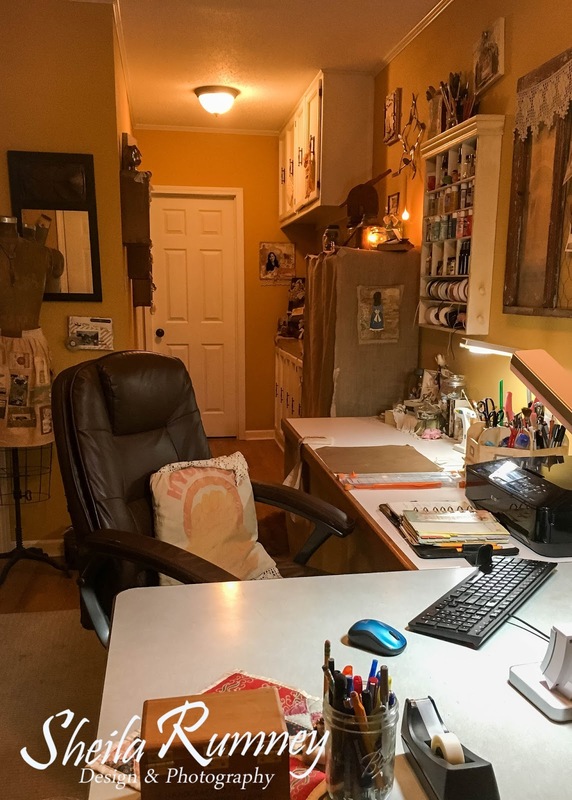 I loved seeing your studio, Shelia. 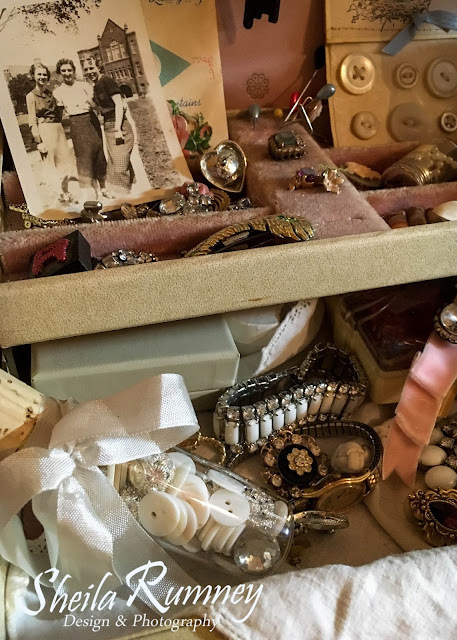 How wonderful that you have your grandmother's jewelry box...that is a true treasure! Hi Sheila!!! I think you are one of a very small group of ladies that have participated every single year!! I always enjoy coming for a visit. We have "known" each year for a quite a long time now!!! Thank you again for sharing your lovely space. You are always inspiring! What a beautiful space Sheila! Always love looking at your vintage goodies and beautiful creations! Great crafting space. I love the vintage pieces and the apron on your dress form! What a great space and filled with so much eye candy!! Thanks for sharing!! Very pretty studio! I love how everything is organized and handy. Thank you for the tour. I also look forward to Where Bloggers Create so I can get things organized. I love your space, and the vintage pictures that were in your pictures. They reminded me of some of my pictures of grandparents. I think I will get them out and display them. Thank you for sharing your creative space. What a very lovely and inviting space to create in. I love all of your vintage treasures.